While living in Poland, I heard of Janusz Korczak briefly. I read his book, King Matt the First, since all the Polish children read it at some time in their childhood. In 1988, 20 years after my arrival in US, I started having an urge to do things for children. My daughter was 10: I wanted to do things for her, with her and introduce her to social and environmental issues. I did it by creating the Children’s Garden in the Fair Lawn, NJ Recycling Center, followed by 2 consecutive Earth Days celebrations and a Children’s Vigil with planting of the Peace Poll. We moved to Chestnut Ridge , NY and I continued my “mission” by starting, with 2 other parents, the Green Meadow Waldorf School Children’s Garden. Then came the dream. 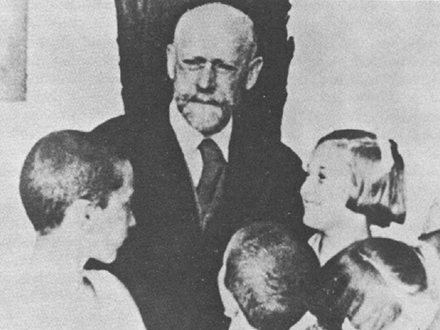 I don’t dream much, but one night I had this dream of Janusz Korczak with his children. Nothing less or more. For some reason I knew that it was him. The picture was similar to the picture on the cover of Betty Lifton’s book, which was not published yet. The story could have ended there but it doesn’t. I am not a person that remembers dreams and this dream started coming almost every day for months. Was that some kind of a message? I thought so but did not know what. I thought about children, what could I do for them? I saw how many of them struggled in school and how their needs were not met by what the schools were providing. In the meantime, I was still working in the computer field but I started doubting that was going to be the field I would retire from. My soul searching, arduous process of 4 years started. Messages finally started coming. Nutrition, Ayurvedic Medicine, Chinese Medicine, etc. I chose Chinese Medicine. As soon as I entered Tri-State College of Acupuncture, the dream about Janusz Korczak totally disappeared for 3 years. On the day that I graduated from the program, after a beautiful graduation party, that very night, the dream came back. For some reason, I finally realized that the message was that I was to work with children. Now that I knew acupuncture, it was clear to me that I was not going to use needles on children and my search for natural modalities that I could combine with acupuncture begun. In the winter of 2000, the first child came for the 6-week program. I wrote a 1-page proposal on Sunday and on Monday got a call from a father, who heard about me from a social worker in his son’s school. I worked with the boy for 8 months. It was a great experience! Things changed for him, the most dramatic was his being able to walk straight instead of pigeon toe. Other children followed and the program was increased to 12 weeks and now to 18 weeks. As soon as the first brochures were printed, I dedicated Shining Mountain Children’s Center to Janusz Korczak. I didn’t read much about Korczak except for his biography by Betty Lifton. In 2007, I visited two orphanages in Warsaw and started looking for Korczak’s biographies and his books in English. There are some but not many. In the past two years I connected with people all over the world who were touched by his spirit. Most of them out of the blue learned about him and could not forget about him. We all trust that his memory, his incredible work with and for the children is going to be used some day on a large scale. Many of us are working to bring new ideas into the educational system and we are discussing a possibility of a Center for Janusz Korczak on the east coast of the US. In November 2010, I spoke at length with Mrs. Batia Gilad, Chair of the International Janusz Korczak Association. The conversation proved to me for the first time in a long time that the idea for the center in the US is not crazy. As Yoko Ono once said: “A dream you dream alone is only a dream. A dream you dream together is reality.” Time will only tell when, where and how the center will happen. So why do we need to create the Center? As Korczak did, many of us truly care about children today. We want them to have good lives, we want them to be carefree, enjoy the outdoors, grow strong, smart and passionate about life – not depressed, stressed out and unhealthy at a younger and younger age. Children are fun to be with, they are fresh, they have amazing ideas. We learn so much from them when we take the time to be with them, listen to them and enjoy them. They are so open, innocent; we want to appreciate them and allow them to teach us so that we can help them bring the best in them, all these incredible gifts they brought with them – before it is too late, before their parents, teachers, media, friends cover their sacred core (the core that belongs to the infinite wisdom), with layers and layers of don’t and dos, of prejudices, fears, and feelings of not having enough and not being enough. Kids are so resilient even the ones who have very little, know how to find things in nature – they know nature won’t mind and will share its treasures with them. And that is why the center is important, a place where Korczak’s wisdom and wisdoms of many other educators (i.e., Rudolf Steiner, Maria Montessori, etc) can be gathered and disseminated to children, parents, educators and healthcare providers. Photograph of Janusz Korczak, 1933, reprinted courtesy of Beit Lohana Haghetaov, Ghetto Fighter’s House, Israel, and Janusz Korczak Workshop Archives, Warsaw. Mariola can be reached at shiningmtnny@aol.com.